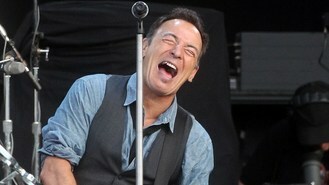 The US star will bring back The E Street Band when the event moves to its new location at the Olympic Park this summer. Also headlining the Hard Rock event will be Kasabian, playing their only UK festival, while other performers over the final weekend in June will be Paul Weller, The Black Crowes and Klaxons. Springsteen has a return booking after his show famously overran in 2012, when the event was staged at its old home of Hyde Park. The star had been joined by guest musician Sir Paul McCartney for two songs and they were poised to play more when the plug was pulled in order to comply with late-night noise restrictions. E Street Band guitarist Steve Van Zandt grumbled afterwards that Britain had become a "police state" and London mayor Boris Johnson criticised "an excessively efficacious decision". Promoters of the event went on to lose the contract for Hyde Park gigs and have now moved their festival to east London, to what is now known as the Queen Elizabeth Olympic Park. But Springsteen appears happy to complete his unfinished business by signing up for another show which will take place on June 30, with The Black Crowes supporting. Kasabian - whose hits include Club Foot, Empire and Fire - will play on June 29, with Weller, Klaxons, The Cribs and Tribes supporting.